At a huge public convention held at Siddaganga Mutt on the Republic Day, January 26, 2019, in the presence of Sanehalli Sri Panditaradhya Swamiji, padyatris of the Madya Nishedha Andolana decided to intensify the ongoing liquor ban movement. A resolution passed at the convention, in which thousands of rural women joined in, the marching women declared that on reaching Bengaluru will “occupy Vidhan Soudha” on Mahatma Gandhi’s martyrdom day, January 30. Along with that, some of the state’s well known personalities will start a Jail Bharo Andolan in support of women activists. 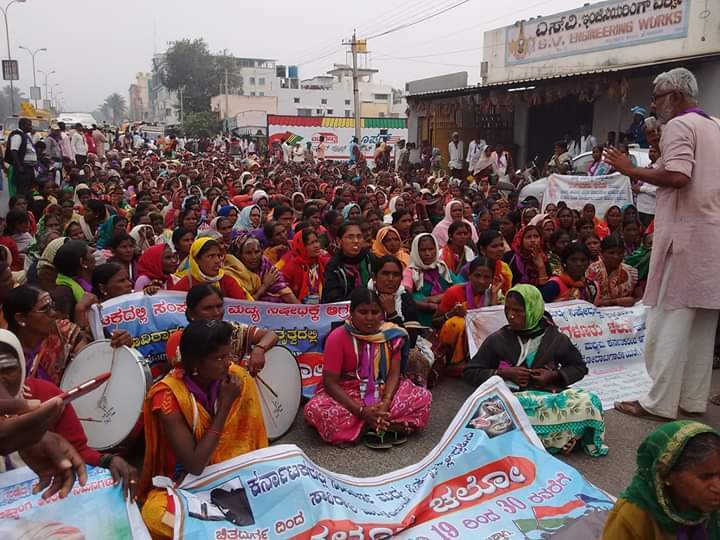 On the same day, in every Taluk and District centres, women activists will protest in support of the Andolan. Rural women will identify and collect the illegal sale of liquor in their respective villages and wards and burn it. By doing this women will support Jail Bharo Andolan against the government for violating the Constitution. Article 47 of our Constitution clearly specifies liquor ban along with prohibition of consumption of intoxicating drugs, but it is an irony that no ruling party since Independence till date has considered banning liquor as part of its agenda. Political parties, it seems, want poor to remain poor by ensuring that poor people spend money for these kinds of addictions. This is not a new movements. These began since the days of Gandhiji. Recently, a historical movement with the participation of 40,000 people took place in Karnataka on October 2016 at Raichur. In spite of these efforts, ruling parties haven't given respect to women; instead, they have given license to open additional 500 liquor shops in the name of revenue generation. The government is in the false illusion that its coffers are full because of liquor sales. It should come out of such an Illusion and give value to lakhs of women voices by constitutionally banning liquor completely in Karnataka. 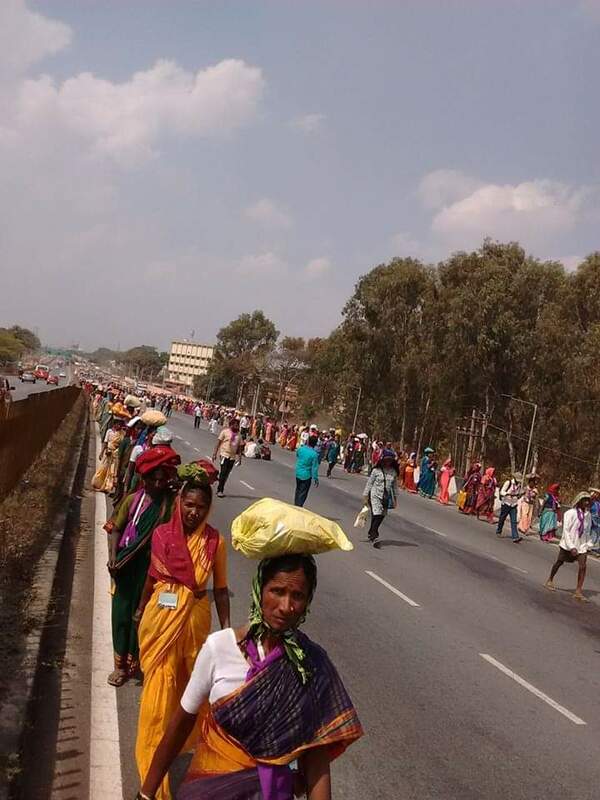 The patayatra began from Chitradurga on January 19, and today is the 10th day of the march. On January 30, the day Gandhiji was martyred, women will march towards Bengaluru and seige Vidhan Soudha, and for this it is joining hands with other people's movements, organisations, students groups, youth thinkers, and other people who have strengthened the struggle. Women want liquor to be banned in the state, and they don't mind going to jail for this. It is indeed very heartening to see women walking with their children in hot sun, and old people, too, walking with them. It is very shameful that none of the elected representatives have come forward to visit the padyatris. They are leading a shameless life with poor people's money. This whole struggle is represents those women who see death and pain every other day. Women bear the brunt of violence inflicted upon them in their everyday life by their husbands, bothers and fathers, and they have joined the padyatra with the steely resolve to get liquor banned at any cost. It's organisers have requested all to join hands to intensify the struggle to get rid of a sinister practice and usher in a healthy society.